After days of writing about all the food prep, the dinner really came together. I thought I'd post some of the recipes I used for this Thanksgiving dinner. I tend not to use any one source to create my culinary masterpieces, which as many friends can tell you either turns out horribly wrong or somehow manages to come out wonderfully right. My first foray into turkey making was a hit--and let me tell you, I have never felt more pressure to get something right than in preparing the main dish of a big holiday meal. Thaw turkey in fridge overnight. Remove any entrails and place in large oven bag in a deep roasting dish. Boil water, salt, brown sugar, onion, carrots, green onions, pepper in a large pot for half an hour. Let cool. Pour brine over turkey and chill in fridge for 24 hours. Preheat oven to 350 degrees. Rinse turkey well and pat dry. Place turkey in a fresh, flour-coated oven bag. 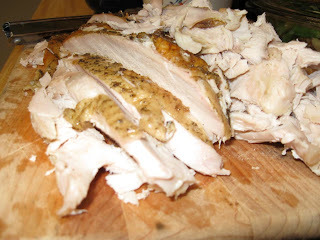 Mix oil, garlic and seasoning in a small bowl and coat turkey. Stuff with generous amounts of bread stuffing. Roast for 3 hours. Save juices for gravy. Cool, carve and serve. Gravy has to be the easiest thing I made. And it was the only thing I had ever made before. Strain turkey juice into a medium sauce pan. Add broth and bring to a boil. Mix flour and water in a small bowl until a smooth, pasty consistency. Slowly add to boiling stock. Reduce heat. 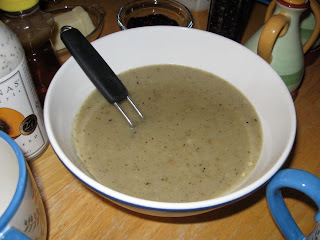 Boil and stir continually until gravy begins to thicken. Salt and pepper to taste. Let stand for at least five minutes. Honestly, for how much effort it took to make this alternative to green bean casserole, this wasn't really worth it. But it looked good. Toast almonds in large frying pan over medium heat. Remove and set aside. Melt butter and saute beans and onions for five minutes. Add wine and steam covered for 10 minutes. Remove beans and onions. Bring sauce to boil and reduce by half. 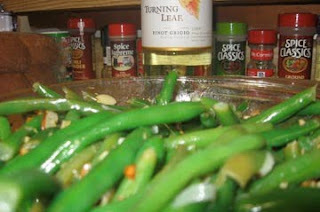 Pour sauce over beans, salt and pepper to taste, and toss to coat. Add almonds right before serving. 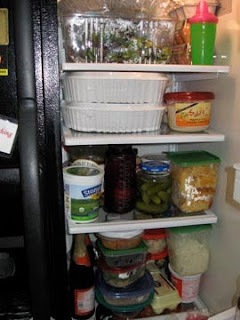 There might have been leftover, but let me tell you, now that everyone is gone, that fridge is totally empty. I'll have to do some major shopping tomorrow if I want to eat this week.